How Did This Woman Win the Texas Lottery 4 Times? 4 Lottery Horror Stories: Don't Let This Happen to You! 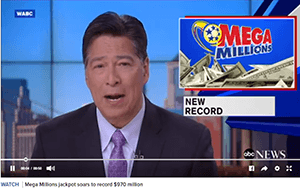 Mega Millions Lottery, Current Jackpot: $192,000,000 live drawings are held at WSB-TV studio in Atlanta, Georgia every Tuesday and Friday night at 11:00 PM Eastern Time. Pools close at 10:45 PM, although for online lottery tickets purchases please allow extra 1:30 -3:00 hours. Drawings and results are broadcast through numerous media sources including TV stations, radio, and the internet. Always be sure to check your numbers because you only have a certain number of days to claim your winnings! This time frame varies from state to state, so you should make sure you claim your prize before the time limit is up. WSB-TV in Atlanta, Georgia, where the actual drawing takes place has a livestream of its newscast below, where it will also show the drawing when it is broadcast. It would be worse to never win the lottery at all than to win and not find out you hit a big jackpot until after the time was up to claim it! 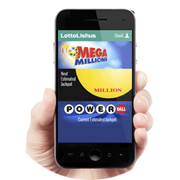 Playing the lottery online is becoming increasingly popular because it's so easy and convenient. No need to go somewhere and stand in line for a ticket. No worries about forgetting a ticket or losing a ticket, either. When you play the lottery online, you simply choose a reputable website who either sells tickets or directs you to a site where you can buy tickets. After you register with the site, you choose which lotteries you want to play and how many tickets you want to buy, along with the numbers you wish to play. An agent is sent to buy these tickets on your behalf. They are then placed in a secure place until the drawing is held. The site will check your tickets for you and notify you right away if you are a winner. Learn More About Buying Lottery Tickets Online. Play the Mega Millions lottery today for a chance to win one of its giant jackpots! About Us Contact Us Want to become an affiliate?